Buy an annuity now or wait for interest rates to rise? The size of the lifetime monthly payment you'll receive from an immediate annuity depends for the most part on two things: the level of interest rates and your age. Essentially, the higher rates are and the older you are when you purchase the annuity, the larger the payment you'll receive. So at first glance holding off buying an annuity until interest rates climb from their current historic lows might strike someone as a no-brainer, the only logical way to go. But that's not necessarily the case. The fact that interest rates have been at or near historic lows for many years now may lead one to believe that a turnaround is all but inevitable sometime soon. But people have been predicting that rates will rise for the last six years, if not longer. And although there have been some minor ups and downs, the long-awaited rebound in bond yields, which largely determine annuity payouts, has yet to arrive. If anything, yields have trended lower over the past year or so, even dipping into negative territory in a few countries, most notably Germany and Japan. I expect that bond yields will rise at some point in the future. But neither I nor anyone else, the Federal Reserve included, knows by how much or when that might be. If anything, the recent Brexit decision makes things even murkier. So you could be in for a long wait. And while it's true that simply waiting until you're older to buy an annuity will get you a higher payment for the rest of your life even if interest rates remain exactly where they are today, it's also true that the older you are when you buy, the shorter the rest of your life will be. Which means you'll collect those higher annuity payments for fewer years. Here's one more thing to think about: Even if rates do start to climb sometime soon, will that really solve your problem? Chances are that once rates rise, you'll begin asking yourself another question -- namely, should you invest in an annuity now or hold off still longer in hopes that rates will ascend even higher, affording you yet a larger payment? In short, rising rates won't end the "should I buy now or wait" guessing game. Given the fact that we can't really know the future path of interest rates, what do I recommend you do? Well, the first thing is get a handle on how much guaranteed income you actually need. Some people may be going on a rule of thumb they've heard about how much of one's savings should be in an annuity, others may be basing their decision on a sales pitch and some may just be winging it. A better way to go is to rev up an online retirement budgeting tool like BlackRock's Retirement Expenses Worksheet or the budget calculator within Fidelity's Retirement Income Planner so you can tally your estimated retirement expenses and also gauge what portion of them represent essentials such as housing, utilities and medical costs. If the amount you'll receive from Social Security plus any pensions covers all or most of your basic living expenses, then you may need little, if any, additional guaranteed income. You may be able to get by easily enough by making periodic withdrawals from your savings to pay for essential expenses Social Security and pension income don't cover plus the cost of discretionary items. If the gap between your basic expenses and Social Security and any pension payments is large, however, then you may want to devote more of your savings to an annuity to bridge that gap. To see how much lifetime annual income different sums of money will buy you given your age, gender and other factors, you can check out this annuity payment calculator. As for estimating how long your retirement savings might last based on the level of annual withdrawals you make, this retirement income calculator can help. 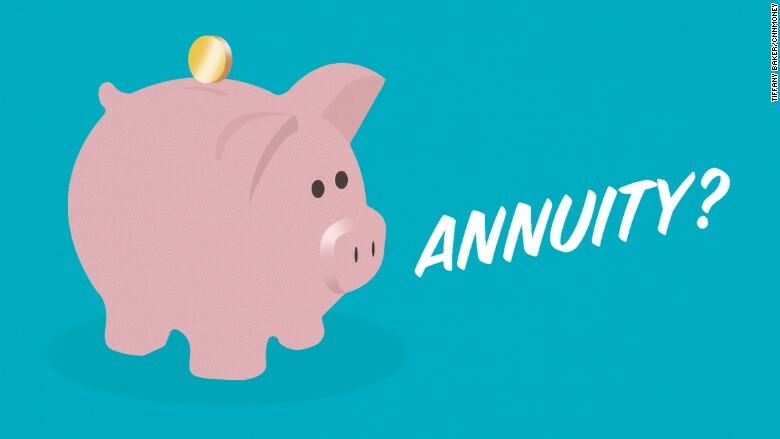 Related: Should you buy an annuity before you retire? But even after going through the analysis described above, the many lifestyle changes involved in making the transition to retirement can still make it difficult to know exactly how much you'll spend and how much guaranteed income you'll need. So to avoid the mistake of devoting too much of your savings to an annuity, you may want to hold off buying guaranteed income until you've got some retirement living experience -- say, a year's worth -- under your belt. Just to be clear though: The aim here isn't to hold off in hopes that interest rates will rise. Rather, it's a way to give you a better idea of how much annuity income you should buy. When you decide that you're ready to "annuitize" some of your savings, you may also want to consider doing so gradually. For example, if you're planning to convert, say, $150,000 of your nest egg into lifetime income, you might put $50,000 a year into three separate annuities over the course of three years rather than committing the entire sum all at once. This approach has several advantages. One is that it gives you more opportunities to size up how much guaranteed income you really need. If it turns out you've got pretty much all the guaranteed income you want after acquiring the first annuity you intend you buy, you can abandon your plan to purchase the other two -- or just wait longer before deciding whether to continue with your original plan. Buying annuity income a little at a time also somewhat addresses your concern about interest rates by making it less likely you'll invest all your annuity money at today's low rates. That said, there's also no guarantee that any future purchases will be made at higher rates. Whenever you decide to take the plunge, you'll want to check out these tips for getting the best deal on an annuity and ask these three questions to make sure you understand the ins and outs of what you're buying. It would be nice if it were otherwise, but the fact is that you can't know in advance what interest rates are going to do or when they'll do it. So when it comes to turning some of your savings into lifetime income, I suggest that you first figure out how much annuity income, if any, you'll need and then buy in stages so that you can re-assess your income needs as you gain more experience in retirement. This strategy won't guarantee you'll get the highest payout, but it makes more sense than speculating on the future direction of interest rates.